Hiatus over! I have so much to share with you :). There are the socks below, a lovely hat I knit for myself out of a bamboo-silk blend, and a blanket (this one) which is so close to being done, I can taste it! Plus a little bit of sewing, too! Pattern: Basic sock worked over 60 stitches with tiny baby cables running along the sides. Short row heel and standard wedge toe. Yarn: Fleece Artist 100% superwash merino sock yarn in the Hercules colorway. I really liked the texture and twist of this yarn. Yahaira and I were both surprised that the finished socks are much more blue than the skeined yarn would lead you to believe. Reds and goldens are so predominant in the skein, but clearly take a secondary role in the knitted fabric. Not only that, I noticed that one sock came out brighter than the other, even though both were knit (one right after the other) from the same skein. As long as the socks fit and are comfortable, that’s a non-issue, right? Very cute socks. 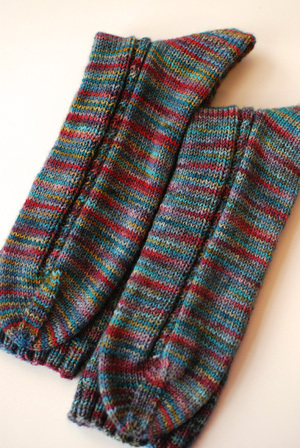 I’m really into a plainer sock right now. The mini cables give it just enough pizzazz. And that blanket you mentioned? I just finished one and those ends that needed weaving in? Oh, that was painful. Yes! They’re still definitely a pair, a very pretty pair no less! Is the colour difference very apparent IRL? VERY pretty socks! May I ask how long (or short) the color repeats are, that prevented pooling so totally and beautifully? I’m playing around with dyeing m own sock yarn now, and would love to try for a similar effect! These are great! Mostly stockinette to be mostly mindless and fast, but the wee cables add a little interest (in knitting and in the final product). The yellow and red bits really do “pop” from the blue too, so they are very cheery. I had a very similar experience with socks knit from Fleece Artist yarn… with one sock appearing faded compared to its twin. Curious! Ooh, lovely socks. And lucky Yahaira! I’ve noticed that about some skeins, that the colors you expect to predominate fade into the background. Right now I am knitting Jaywalkers, my final pair of socks for xmas. Whew! Lovely. My own radio silence on the blog (at least on a knitting front) makes me feel like I’m not getting hardly any knitting done. Maybe I’ll post one of the things I’ve finished, just so it will feel really finished. I’ve had a similar experience with that yarn, colorway Cosmic Dawn. One sock has more pink highlights, the other more turquoise. The colors were all bright, but now they are fading where the socks receive the most wear. 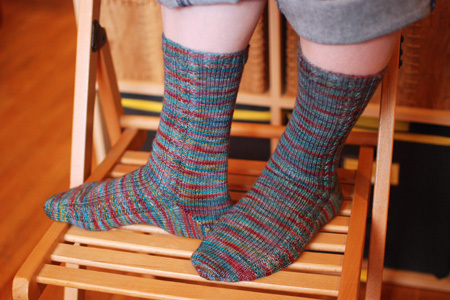 But Yahaira’s socks are lovely, perfect match of yarn and pattern. I’m really getting into baby cables of late. Love these simple socks. FA yarns in all the blends seem to have a light and dark end on most skeins. This usually doesn’t bother me too much because I love the yarns but I made a pair of “Spring Forward” out of a skein of springy colors and one sock was predominantly blues/greens and the other was pinks/yellows. Pretty, pretty socks! I’ve onl made one pair of socks, and now I’m inspired to make a second pair. I love these socks! I’ve had 2 socks knit from 1 skein look slightly different as well. I agree that it is a non-issue. BTW, do you plan on posting these on Ravelry? I know that they are basic socks but I think they are a great combination of yarn and pattern and would love to be able to “favorite” them. Love those socks! Which Fleece Artist yarn base are they knit in? Hi, first time on your blog,your knitting is amazing!